Few investors can move the market the way Warren Buffett can. His hedge fund, Berkshire-Hathaway, is one of the most closely observed funds. Buffett has always followed an investment strategy that allows him to take large positions in securities if he views the investment to have a high probability for growth. That strategy continues into 2018 where the top four positions in his portfolio are all weighted at over 10 percent of Berkshire’s portfolio. However, even when Buffett does not add to his position on a stock, and sometimes even when he reduces his holdings, it doesn’t mean he has soured on the stock. Buying and holding stocks has always been one of the keys to Buffett’s success. Buffett is a strong advocate for investing in what you know. To that end, he continues to invest in many of his mainstay businesses. So what stocks does Buffett like today? We’ll show you several stocks where Buffett has continued to add to his position, a few that remain mainstays even though Berkshire is holding its current position and even a couple that Berkshire-Hathaway remains bullish on despite reducing their investment. It’s no secret that Warren Buffett loves Apple (AAPL). As in, really loves them. The Oracle of Omaha has mused that he wouldn’t mind owning the entire company. And he backs his lavish praise with investment dollars. Buffett increased his position in Apple by 44 percent. Berkshire now owns over 74 million shares of Apple, and the company occupies the most space in Buffett’s portfolio, totaling 21.3 percent. A large stake to be sure, but completely in line with Buffett’s investment philosophy. Among its many attributes, Apple remains very popular with its core consumer base who continues to snap up the company’s products. They are sitting on over $250 billion in cash and are quickly growing their services division to bring in new revenue streams. And perhaps the most positive indicator is that Apple’s stock is trading at a discount to the broader market with a forward P/E multiple of 14.9. All these positives seem to override any concerns Buffett may have about Apple’s heavy reliance on iPhone sales, which account for more than 60 percent of their revenue. This is particularly interesting since Buffett himself professes not to own Apple products. Ratings Breakdown: 22 Buy Ratings, 20 Hold Ratings, 3 Sell Ratings. Buffett has owned Monsanto (MON) for a long time and for the last several years has been investing in the agricultural giant in anticipation of the German company Bayer AG completing a takeover of Monsanto. When the all-cash deal was finally closed in June of this year, Bayer paid $128 per share, giving the stock a nice boost (during the first quarter of 2018, the stock’s maximum price was $106 per share) and sending $2.4 billion of cash back to Berkshire-Hathaway. And there may be even more room for the stock to run with the new entity Bayer-Monsanto seeking antitrust clearance. The seed and crop chemicals industry has gone through a wave of consolidation. Bayer-Monsanto now joins Dow Chemical Co. who combined with DuPont Co. and China National Chemical Corporation who took over Syngenta AG. Buffett added approximately 7.3 million shares to its portfolio and now owns nearly 19 million shares of the agricultural giant. Monsanto Company, together with its subsidiaries, provides agricultural products for farmers worldwide. It operates in two segments, Seeds and Genomics, and Agricultural Productivity. The Seeds and Genomics segment produces row crop seeds, including corn, soybean, cotton, and canola seeds under the DEKALB, Asgrow, and Deltapine brands; and vegetable seeds, such as tomato, pepper, melon, cucumber, squash, beans, broccoli, onions, lettuce, and others under the Seminis and De Ruiter brands. It also develops biotechnology traits that assist farmers in controlling insects and weeds in corn, soybean, and cotton crops under the SmartStax, YieldGard, YieldGard VT Triple, VT Triple PRO, and VT Double PRO brands; Intacta RR2 PRO brand; Bollgard and Bollgard II brands; Roundup Ready and Roundup Ready 2 Yield brands; and Roundup Ready 2 Xtend and Bollgard II XtendFlex brands. In addition, this segment licenses a range of germplasm and trait technologies to large and small seed companies. The Agricultural Productivity segment manufactures and sells herbicides for nonselective agricultural and residential lawn and garden applications for weed control under the Roundup brand name; and herbicides for selective agricultural applications for weed control under the XtendiMax brand name. The company markets its products through distributors, independent retailers and dealers, agricultural cooperatives, plant raisers, and agents, as well as directly to farmers. It has strategic alliance with Pairwise Plants to advance agriculture research and development by using gene-editing technology. The company was formerly known as Monsanto Ag Company and changed its name to Monsanto Company in March 2000. Monsanto Company was founded in 2000 and is based in St. Louis, Missouri. If there’s an industry that may be a close second to Apple in Warren Buffett’s heart, it could be the banking industry. Berkshire-Hathaway holds positions in eight different bank stocks, which adds up to over $73 billion of its portfolio. U.S. Bancorp (USB) is not the largest of its bank holdings, but it’s certainly not the smallest either. With Berkshire’s recent purchase of 3.8 million shares, it brought its total stake in the company to over 87 million shares that are currently valued at around $4.6 billion. This makes U.S. Bancorp the fourth-largest bank stock in Berkshire’s portfolio. The Minneapolis-based banking giant has nearly a half a trillion dollars in assets. This cash reserve is one reason it is simply more efficient and generates more profit than many of its peers. Also to its credit, during the 2008-2009 banking crisis, U.S. Bancorp did not have a single quarter of negative earnings. U.S. Bancorp is the parent company of U.S. Bank National Association. U.S. Bancorp, a financial services holding company, provides various financial services in the United States. It operates in five segments: Corporate and Commercial Banking, Consumer and Business Banking, Wealth Management and Investment Services, Payment Services, and Treasury and Corporate Support. The company offers depository services, including checking accounts, savings accounts, and time certificate contracts; and lending services, such as traditional credit products, as well as credit card services, lease financing and import/export trade, asset-backed lending, agricultural finance, and other products. It also provides ancillary services comprising capital markets, treasury management, and receivable lock-box collection services to corporate customers; and a range of asset management and fiduciary services for individuals, estates, foundations, business corporations, and charitable organizations. In addition, the company offers investment and insurance products to its customers principally within its markets, as well as fund administration services to a range of mutual and other funds. Further, it provides corporate and purchasing card, and corporate trust services; and merchant processing services, as well as cash and investment management, ATM processing, mortgage banking, and brokerage and leasing services. The company offers its products and services through operating a network of 3,018 banking offices principally operating in the Midwest and West regions of the United States, as well as through online services and over mobile devices. It also operates a network of 4,681 ATMs. The company was founded in 1863 and is headquartered in Minneapolis, Minnesota. Ratings Breakdown: 4 Buy Ratings, 9 Hold Ratings, 0 Sell Ratings. Did we mention that Warren Buffett likes bank stocks? Although Bank of New York (BK) has been in Berkshire Hathaway's portfolio for quite some time, it has now climbed into the top ten of Berkshire's portfolio. In the first quarter of 2018, Berkshire bought 1.37 million shares, bringing its total share volume up to approximately 62.2 million shares that are worth an estimated $3.5 billion. In the first quarter of 2018, shares of the company rose nearly six percent amidst strong first-quarter financial results. Additionally, earnings per share rose. The bank cited solid gains in fee-based revenue and an increase in net interest income as drivers of its growth to start 2018. BNY is also emphasizing custodial services above retail banking, showing that it does not always behave the way other banks do, which hasn’t always translated to positive performance. In the second quarter, the good news continued with a reported increase in net income to $1.1 billion dollars and earnings of $1.03 per share. This was up 14% year-over-year. Revenue also increased in line with analysts’ recommendations. Ratings Breakdown: 3 Buy Ratings, 5 Hold Ratings, 2 Sell Ratings. Another industry that is a favorite of Warren Buffett is the airline industry. For years, Buffett expressed criticism of the industry as a whole. However, ever since 2016, Berkshire-Hathaway has been actively investing in the four largest U.S. airlines. Delta (DAL) is the smallest of the four, however, it is the only airline in which Berkshire has increased its investment in 2018, buying approximately $26 million worth of the stock and raising its ownership to 7.6 percent. Like all airline stocks, Delta has been stung by higher oil prices that have lowered its stock price by 10 percent. However, Delta reported second-quarter revenues that increased eight percent year-over-year and saw total revenue per available seat mile (TRASM) increase 4.6% in the quarter and is now up 4.8% for the year. Analysts see Delta as being well-positioned for the trend that has consumers valuing the experience of travel to the extent that they are continuing to make travel plans despite higher oil prices. Additionally, some industry analysts are speculating that Berkshire may be purchasing Delta and other airline stocks as a precursor to acquiring an airline of its own. And now for a few stocks that Berkshire continues to hold and shows no signs of letting go. Few statements could ever mean more to a company’s fortune than to have someone of Warren Buffett’s cache say that his company will never sell their shares in your company. Such is the case for Coca-Cola (KO). Despite the problems that have hit the industry over the last few years, including Coca-Cola's own heavy investment in re-franchising, the global beverage company holds an exalted place in Buffett’s portfolio. One reason for this is the investment it is making in brands like Monster Beverage, Keurig Green Mountain, and Suja Juice. It has also projected to save $3 billion annually by 2019 due to some operating changes. At the end of 2017, Coca-Cola was the fourth-largest company in Berkshire Hathaway's portfolio. Berkshire held 400 million shares of stock that are valued at $14.9 billion. Barclays is projecting a five percent increase in organic growth for the company in 2019 and 2020. They are also projecting an eight percent growth in profit over that same period. CFRA also sees the potential for improved margins in the stock beginning in 2019. Ratings Breakdown: 7 Buy Ratings, 14 Hold Ratings, 0 Sell Ratings. Another company that benefits from Buffett’s buy-and-hold mantra is American Express (AXP). The company has been in the Berkshire-Hathaway portfolio since the 1960s. Today, it is the fifth most valuable holding for Berkshire-Hathaway. The company owns 151.6 million shares of American Express that are valued at $15 billion. In full disclosure, Berkshire owns positions in MasterCard and Visa but his investment in both of those is nowhere near his position in American Express. The stock seemed to hit a bottom in 2016 when it sunk to $50 a share. Today, it is trading near $100 per share, seems to back up Buffett’s belief in the stock and the company. American Express reported second-quarter earnings per share of $1.84 on revenue that just exceeded $10 billion. The company recently went through some turbulence over a lawsuit regarding the company's alleged efforts to encourage retailers to stop nudging customers to use credit cards with lower merchant fees. The Supreme Court threw out the lawsuit in late June so the stock may regain some traction. Ratings Breakdown: 7 Buy Ratings, 8 Hold Ratings, 1 Sell Ratings. Moody’s (MCO) is another mainstay in the Berkshire-Hathaway portfolio. Moody’s provides credit ratings for bonds. It is currently Berkshire's eighth most valuable holding at $3.6 billion. Buffett's firm owns 24.7 million shares of Moody's which posted revenue of $4.2 billion in the fiscal year 2017. The company continues to post strong numbers. As an example, its operating income was $462.8 million in the first quarter of 2018. Moody’s reported record revenue of $1.2 billion for the second quarter of 2018, a 17% year-over-year increase and a 35% increase from the first quarter. While their revenue increased 12% in the United States, it saw 57% growth in non-U.S. revenue. Moody’s also announced a Corporate Social Responsibility (CSR) Report that provides additional details regarding the company’s progress towards meeting its goal of empowering and rewarding people to address the challenges that can create a better future for communities and the environment. Ratings Breakdown: 3 Buy Ratings, 7 Hold Ratings, 1 Sell Ratings. Wells Fargo (WFC) has been in the news for all the wrong reasons. Fake accounts, inflated sales numbers, coercing employees to engage in fraudulent activity are typically issues that would cause investors to flee. However, Wells Fargo remains the second most profitable bank in the United States and Buffett and Berkshire-Hathaway seem to be willing to reward them for that. The firm has held their position on Wells Fargo at 452.8 million shares. While down from 464.2 million, the value of Berkshire's holdings is still at $27.8 billion, making it Berkshire's second-largest holding. This is an example of where a little context can go a long way. To begin with the amount of stock that Berkshire sold represents only a small fraction of Berkshire’s stake, not exactly a huge sale. 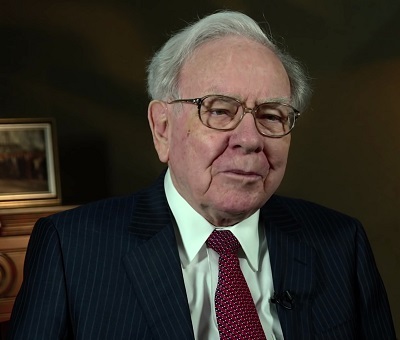 Second, in a recent interview, Buffet reaffirmed his belief in the bank’s long-term profitability stating that he believes it will “outperform the other big U.S. banks over the next 10 years”. And finally, Berkshire owns 9.3% of Wells Fargo. Were that ownership stake to reach 10 percent it would put Berkshire under additional scrutiny by regulators. The bottom line with Wells Fargo is that Buffett likes bank stocks and seems to have faith in Wells Fargo. Look for that confidence to continue although Berkshire may not be increasing their position anytime soon. Wells Fargo & Company, a diversified financial services company, provides retail, commercial, and corporate banking services to individuals, businesses, and institutions. The company's Community Banking segment offers checking and savings accounts; credit and debit cards; and automobile, student, mortgage, home equity, and small business loans. Its Wholesale Banking segment offers commercial loans and lines of credit, letters of credit, asset-based lending, equipment leasing, international trade facilities, trade financing, collection, foreign exchange, treasury management, merchant payment processing, institutional fixed-income sales, commodity and equity risk management, corporate trust fiduciary and agency, and investment banking services, as well as online/electronic products. This segment also provides construction, and land acquisition and development loans; secured and unsecured lines of credit; interim financing arrangements; rehabilitation loans; affordable housing loans and letters of credit; loans for securitization; and real estate and mortgage brokerage services. The company's Wealth and Investment Management segment offers financial planning, private banking, credit, and investment management and fiduciary services, as well as retirement and trust services. As of February 7, 2019, it operated through 7,800 locations, 13,000 ATMs, and the Internet and mobile banking, as well as has offices in 37 countries and territories. Wells Fargo & Company was founded in 1852 and is headquartered in San Francisco, California. Ratings Breakdown: 7 Buy Ratings, 12 Hold Ratings, 0 Sell Ratings. Phillips 66 (PSX) is another example of a company that Buffett may actually own too much of. In a move that was discussed with Phillips 66, Berkshire sold $35 million shares of stock back to Phillips 66. Although this sale amounted to a 43% reduction in Berkshire's stake, the sale was done in order to keep Berkshire's ownership stake to less than 10 percent. By selling the stock back to the company, the shares did not become outstanding shares which may have hurt the stock. And Buffett reiterated his belief in the stock and affirmed that the sale was strictly done to avoid enhanced regulatory scrutiny. Buffett's faith in the company seems to be justified. Phillips 66 announced strong second-quarter adjusted earnings of $1.3 billion or $2.84 per share. This beat analysts' estimates by 25 percent. They also reported a 14 percent increase in their dividend in the second quarter. Chairman and CEO Greg Garland commented, "Our diversified portfolio generated strong earnings and cash flows this quarter. We advanced strategic growth initiatives and continued to reward our shareholders." Ratings Breakdown: 6 Buy Ratings, 6 Hold Ratings, 0 Sell Ratings. Warren Buffet practices and promotes a long-term investment strategy that has demonstrated proven returns over several decades. From controlling your emotions to not panicking to investing in what you understand, the principles Buffett promotes can help investors make good decisions. His investment firm Berkshire-Hathaway once again reported strong earnings and actually is facing a decision regarding how to deploy an unusually high cash reserve.